What a sweet happy pear! Great weekend wishes to you as well. Cooler weather here finally should make it a good one. So Cute!!! He really makes me smile!!! Cute! Reminds me of the pear drops that I really liked as a child! Have a good weekend! xoxoxo. and I loved the last post, too. happy weekend! Gorgeous! But not quite as fabulous as your last post, very generous of you to share! We're all laughing with you - not at you - promise!! You need to list one fact that is relevant to your life for each letter of your name, then tag that many people to continue the game. I've just done mine. It was harder than I expected. Super cute. I like it even better than the one from Cotton Times! What a lovely pear - sometimes the simplest things are the best. My own(imaginary)mango wishes you a good weekend too. 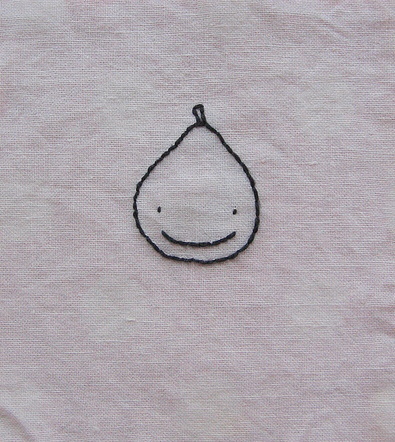 How wonderful to open your blog to a happy little pear wishing us a good weeken! I hope your weekend is lovely, too. He is ridiculously chirpy and really made me smile. I left you a little tag - you must be inundated by the things, but I am compelled to ask anyway, because I'm so curious to know the answers. What a sweet blog. I clicked on you because my daughter's name is Molly, and I liked your blog name. I'm glad I stopped by. Love the pear. Wish I could embroider as well as you do. Your little pear has just taken me back 30 years to when my daughter first began drawing - all her people were pear-shaped with stick arms and legs. They were always happy, too. I just regret not having kept some of 'her early work'!